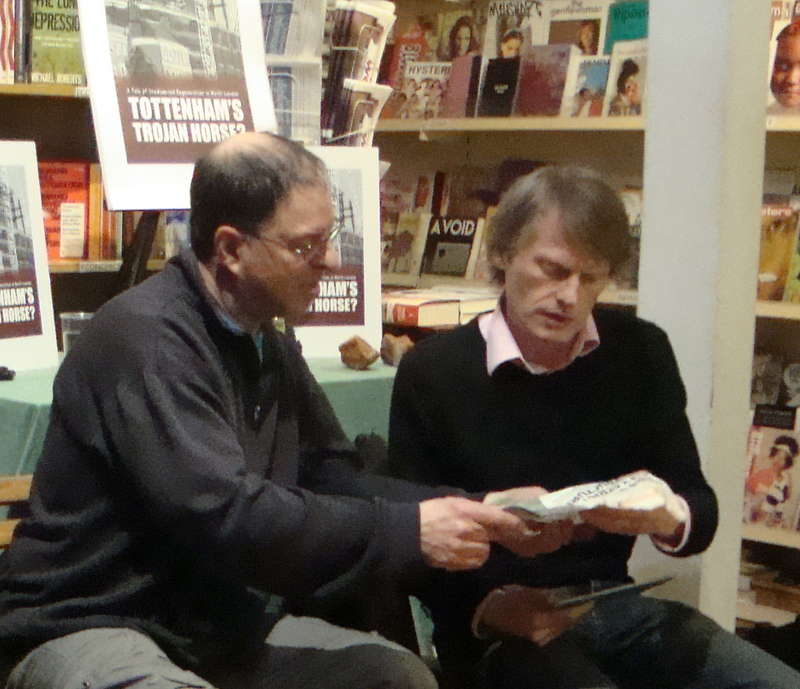 A book launch for "Tottenham's Trojan Horse?" was held at Housmans Bookshop in London on April 4 2018. An audio recording of the whole event is here and a video of the question and answer session is here, both are poor quality - a transcript of the Q&A is here and a transcript of the conversation between Mark Panton, Dave Morris and Martin Ball is here. Photos from the evening are below. 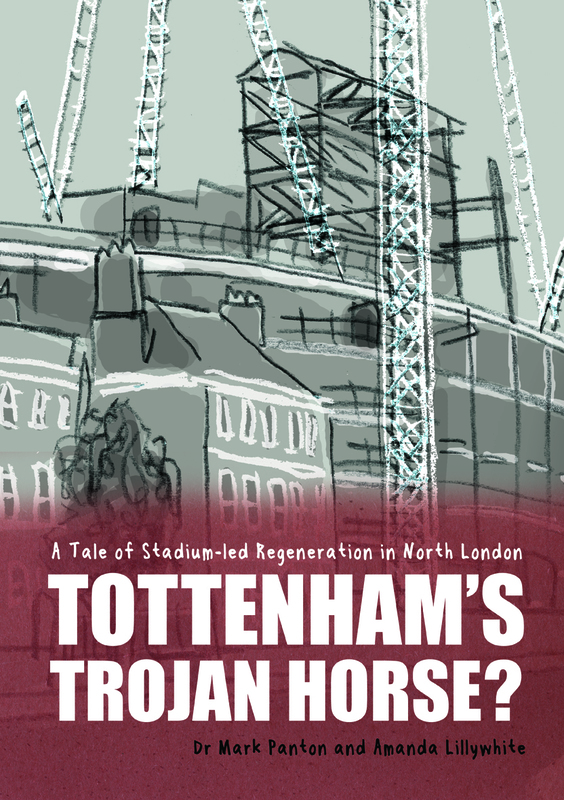 Click here for more information about "Tottenham's Trojan Horse?" including reviews, upcoming events and how to buy or borrow it. Mark Panton answers a question from the audience - a full house on the night. Dave Morris and Martin Ball discuss a newspaper article. 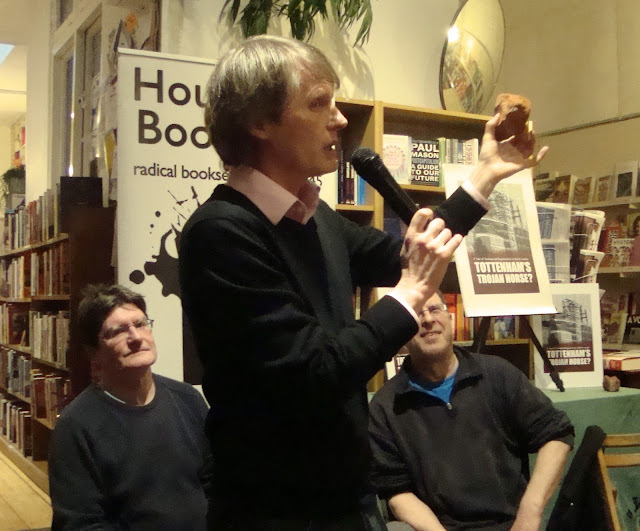 Martin Ball holds up a piece of brick and speaks about a locally listed building that has been demolished. A chocolate cake with an edible version of the cover of "Tottenham's Trojan Horse?". The original posting on Housmans Bookshop website is below. Please contact us if you would like us to take part in your event. 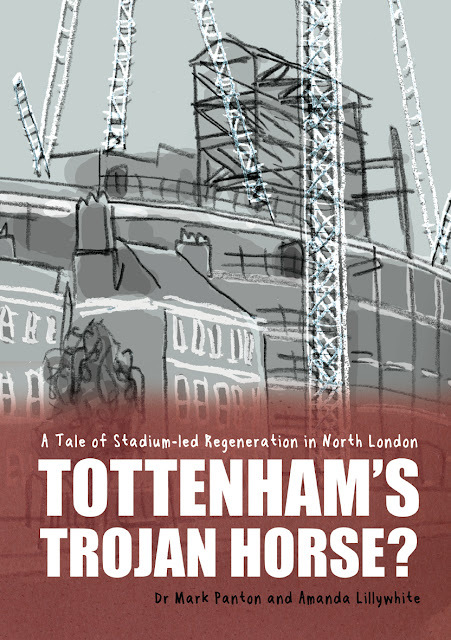 Housmans is delighted to welcome Dr Mark Panton for the launch of Tottenham's Trojan Horse? A Tale of Stadium-led Regeneration in North London. In 2010 Haringey Council in London granted planning permission to Tottenham Hotspur Football Club for a new stadium and other linked developments. 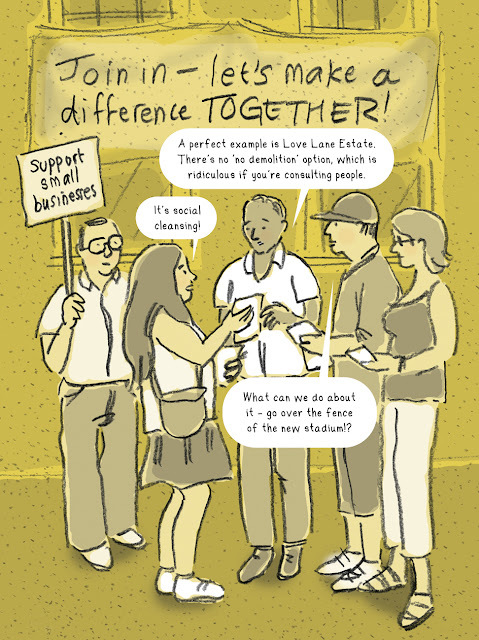 In 2012 Haringey unveiled regeneration plans for the borough that included demolition of homes and businesses to make way for a proposed fans’ walkway from a relocated train station entrance to the site of the new stadium. A process that was already challenging for the football club, the council and the local community now became tortuous. 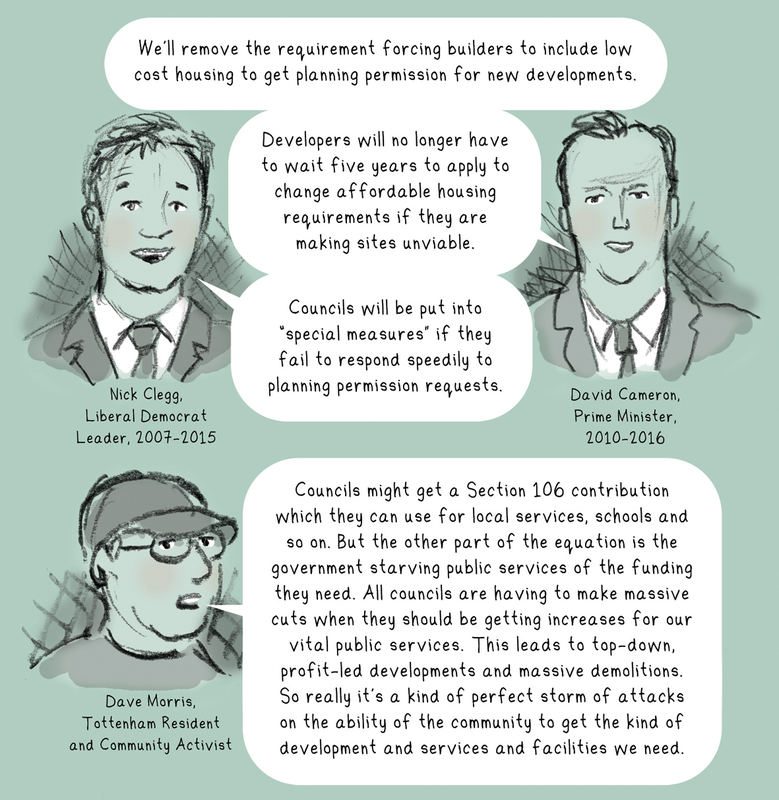 Those most affected by the proposals felt left out of the decision making and had to find a voice. 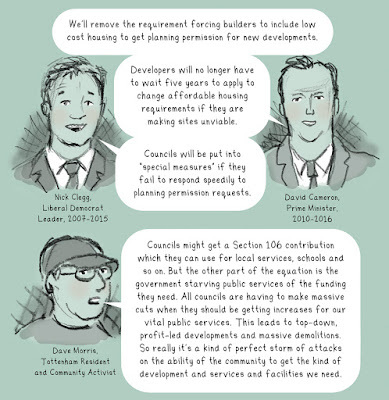 Mark Panton will be in conversation with Haringey community activists Dave Morris and Martin Ball to discuss the demolition of properties for the fans’ walkway in Tottenham, the Our Tottenham network of community groups and the Haringey Development Vehicle. 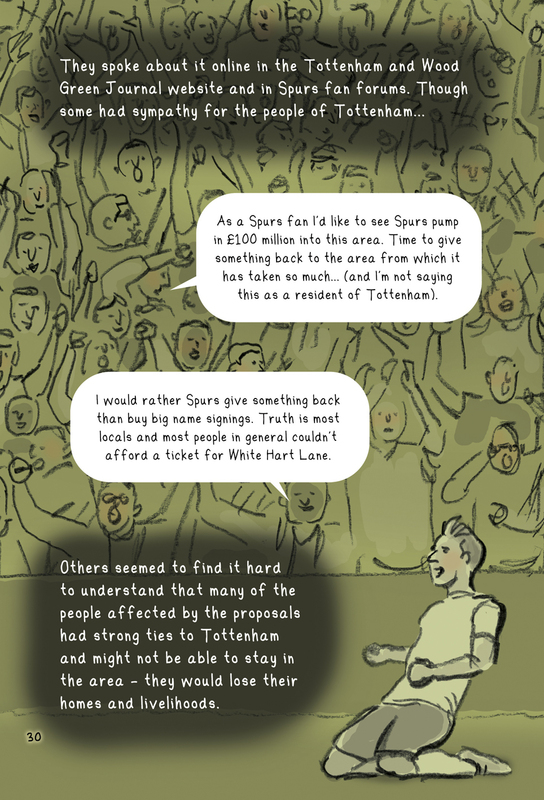 ‘Tottenham’s Trojan Horse?’ is fully illustrated by Amanda Lillywhite in a comic format. It features research from Mark Panton’s doctoral thesis and dialogue from interviews conducted by him. It was funded by the Birkbeck School of Business, Economics and Informatics, University of London. 'You two have come up with an innovative way to turn research for a dissertation which is often read by a few into a book that will reach many. Dave Morris is a former McLibel defendant. He is local activist promoting grass roots development and is active in the Our Tottenham network. Martin Ball is a community activist and Chair of Friends of Downhill Park, Tottenham. Mark Panton joined the Birkbeck Sports Business Centre as a PhD student and recently obtained his doctorate from the University of London based on his research into the use of sport stadiums in urban regeneration projects. His research interests include the sociology of sport, the work of football community trusts and the influence of community groups. Mark currently teaches on a number of courses at Birkbeck College. 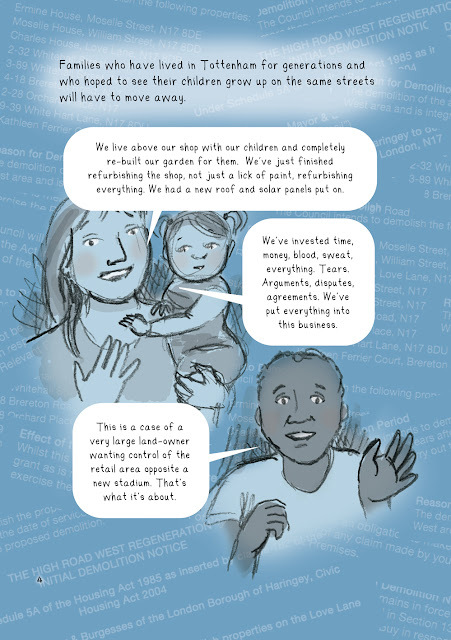 Amanda Lillywhite is a writer, illustrator and comic maker. "We're very easy to find - just a two minute walk from King's Cross/St.Pancras terminals. Housmans is at the bottom end of Caledonian Road where it meets with Pentonville Road. If you have any problems finding us, give us a call!" Amanda Lillywhite and Mark Panton. Simple theme. Powered by Blogger.